The widespread usage of traditional medicine either in the developed or developing countries, makes traditional medicine requirements become a major concern in terms of assuring the safety and effectiveness of treatment. WHO suggested dissolution study to support traditional medicine clinical trials. The catechins from Gambier could reduce atherosclerotic lesions case caused by elevated levels of cholesterol, LDL, and triglycerides. Catechin is hygroscopic that becoming unstable. Raising the stability, Gambier is made to a coated tablet. This study aimed to determine the condition of gambier leaves bioactive fraction coated tablet in simulated human body fluids through an in vitro testing using dissolution tester. Three formulations coated tablet with different coating percentage had been tested using dissolution tester apparatus. The test was conducted in water, acid, and buffer as dissolution medium to generate the dissolution profile. Tablet evaluation showed that the three formulations dissolved 71.25% ± 6.26 to 91.05% ±3.05 in the water, acid, and buffer dissolution medium. The gambier leaves bioactive fraction coated tablet had more than 70% pharmaceutical availability in simulated human body fluids. 1. World Health Organization. WHO traditional medicine strategy: 2014-2023. Geneva: WHO Press; 2013. 2. Vadlamudi HC, Venkaiah, Malik S, Reddy H, Achari S, Raju P. Dissolution test as a quality control tool for herbal formulations-a comprehensive review. International Journal of Innovative Pharmaceutical Research. 2014;5(1):364-9. 3. Wasito H. Obat tradisional kekayaan Indonesia. Yogyakarta: Graha ilmu; 2011. 4. Mustamu RH. Manajemen rantai pasokan industri farmasi di Indonesia. Jurnal Manajemen dan Kewirausahaan. 2007;9(2):99-105. 5. Miftahudin H. Kualitas bahan baku obat lokal rendah impor jadi naik. 2015. Available from http://m.metrotvnews.com/ekonomi/mikro/nN9n1r8b-kualitas-bahan-baku-obat-lokal-rendah-impor-jadi-naik. 6. Kementerian Perdagangan. Menyibak potensi pasar obat herbal tradisional. Warta Ekspor. 2014; p.4. 7. Sa’id EG, Syamsu K. Agroindustri dan bisnis gambir di Indonesia. Bogor: IPB Press; 2009. 8. Amos L. Kandungan katekin gambir sentra produksi di Indonesia. Jurnal Standardisasi. 2010;12(3):149-55. 9. Yunarto N, Elya B, Konadi L. Potensi fraksi etil asetat daun gambir sebagai antihiperlipidemia. Jurnal Kefarmasian Indonesia. 2015;5(1):1-10. 10. Ferdinal N, Nazir N. Phytochemical screening and fractination of gambier (Uncaria Gambir). The Journal of Biomaterial Chemistry. 2013;1(1):23-5. 11. Taniguchi S, Kuroda K, Doi K, Inada K, Yoshikado N, Yoneda Y, et al. Evaluation of gambir quality based on quantitative analysis of polyphenolic constituents. Yakugaku Zasshi. 2007;127(8):1291-300. 12. World Health Organization. TDR operational guidance: information needed to support clinical trials of herbal products. Geneva: WHO Press; 2005. 13. Anief M. Farmasetika. Yogyakarta: Gajah Mada University Press. 2007. 14. Kailaku SI, Udin F, Pandji C, Amos. Analisis mutu dan penerimaan konsumen terhadap permen tablet dengan formulasi konsentrasi pengisi, pemanis, dan gambir. Jurnal Pascapanen. 2005;2(1):34-40. 15. Zheng XQ, Chen H, Du YY, Ye JH, Lu JL, et al. Effect of ultraviolet B irradiation on accumulation of catechins in tea (Camelia sinensis (L) O. Kuntze). African Journal of Biotechnology. 2008;7(18):3283-87. 16. Lucida H, Bakhtiar A, Putri WA. Formulasi sediaan antiseptik mulut dari katekin gambir. Jurnal Sains dan Teknologi Farmasi. 2007;12(1):25-31. 17. Kassim MJ, Hussin MH, Achmad A, Dahon H, Suan TK, Hamdan HS. Determination of total phenol, condensed tannin, flavonoid contents, and antioxidant activity of Uncaria Gambir extract. Majalah Farmasi Indonesia. 2011;22(1):50-9. 18. Subburayalu R, Kunchithapatham J, Pillappan R, Raja D. Formulation and stabilization of aspirin mini-tablets with the aid of weak acid and moisture protective coating. International Journal for Pharmaceutical Research Scholars. 2013;2(4):42-50. 19. Sinko PJ. Farmasi fisika dan ilmu farmasetika. Ed ke-5. Jakarta: Penerbit Buku Kedokteran EGC; 2012. 20. Pradana R, Chaidir, Anwar E. Formulasi tablet salut teofilin menggunakan eksipien koproses pregelatinisasi pati singkong-metil selulosa sebagai bahan penyalut. Majalah Ilmu Kefarmasian. 2010;7(1):49-62. 21. Badan Pengawas Obat dan Makanan. Pedoman uji bioekivalensi. 2005. 22. Stuart AV, Clement Y, Sealy P, Lobenberg R, Jaime LM, Maharaj RG, Maxwell A. Comparing the dissolution profiles of seven metformin formulations in simulated intestinal fluid. Dissolution Technologies. 2015;Feb: 17-21. 23. Saptarini NM and Rusniyanti. 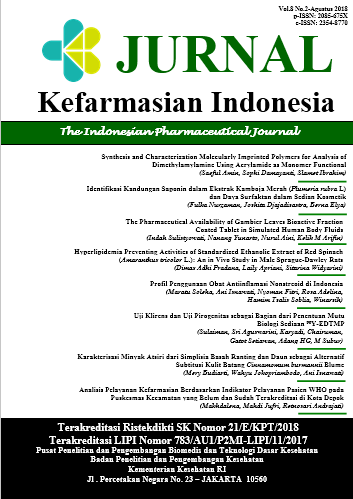 Evaluation of content and dissolution profile of generic amoxicillin tablets marketed in Indonesia. International Research Journal of Pharmacy. 2012;3(12):64-6. 24. Bakhtiar R, Gaesari SR, Zaini E. Pembentukan kokristal katekin dengan nikotinamida. Jurnal Farmasi Sains dan Terapan. 2015;2(2):28-32. 25. Patel H, Shah V, Upadhyay U. New pharmaceutical excipients in solid dosage forms. International Journal of Pharmacy and Life Sciences. 2011;2(8):1006-19. 26. Djafar F, Redha F. Karakterisasi dan modifikasi sifat fungsional kayu manis dalam produk pangan. Jurnal Hasil Penelitian Industri. 2012;25(1):18-27. 27. Santoso B, Tampubolon OH, Wijaya A, Pambayun R. Interaksi pH dan ekstrak gambir pada pembuatan edible film anti bakteri. Agritech. 2014;34(1):8-13. 28. Ansel HC. Pengantar Bentuk Sediaan Farmasi. Ed ke-4. Jakarta: UI Press; 2008.